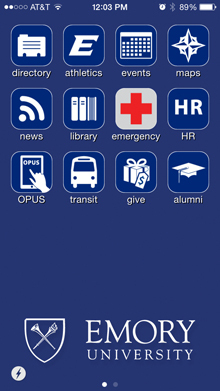 As the 2014-2105 academic year begins, there are many technology resources available for students and other members of the Emory community to get connected on campus and make day-to-day lives easier. Tony Shiver, manager of Student Services for Emory Libraries and Information Technology Services (LITS), recommends the following resources — some new, some time-tested — to make the electronic transition back to Emory as seamless as possible. Student Technology Support: Students should be aware that LITS Student Services provides support for all students' personal technology and electronics devices. Become familiar with the services available at the Computing Center at Cox Hall and the Learning Commons at Woodruff Library, including a new presentation practice and video conferencing space available to students in Room 213 at Woodruff Library.